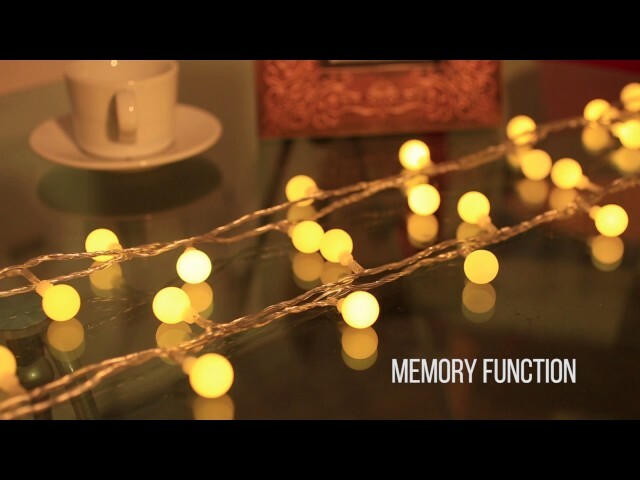 This ball string light is 33ft/10m long enough for your decoration, and with 100 energy saving LEDs, it offers fancy and romantic warm white color lighting performance. With various lighting modes (Combination, In wave, Sequential, Slo glo, Chasing/Flash, Slow fade, Twinkle/Flash, Steady on), it can meet your various lighting needs. You can adjust and shift the mode by pressing the button on controller box, and the light has memory function, that is, when you light the string on, the lighting mode will be the same as the one you set last time. The waterproof rating of this light is IP44, which means it can resist water splashing. So you can use it outdoor and indoor both. 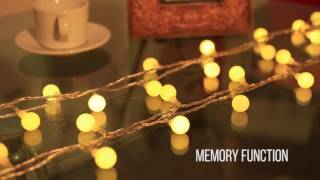 You can use it for ambience decoration and atmosphere creating, like decorating your garden, yard, corridor, holiday, festival, Christmas tree, Thanksgiving, etc. These globe ball fairy string lights cannot be connected in series or cut into shorten length. IP44 rating can only keep the lights away from water splashing, please don't use it in heavy rain. "I bought this product to liven up with photo in my bedroom, and look so amazing, I love it! If you're looking for a curtain light that does not get too bright, this may be a good option for you." "we hang them with suction cup hooks on the lower side of our camper. Fun look." "These are awesome lights. They work perfectly as advertised and delivered in time." Can two or more strings be connected together? As for your question, no, these strings cannot be connected together in series. Can I shorten the length of a string? As for your question, the string light cannot be cut into shorten length. If you have other question or concern, please feel free to contact us at services@lightingever.com or call us at 888.866.8947 (Mon-Fri: 9am-6pm EDT).